Sedna Moon - Solar System Planets And Moons Section. Sedna probably doesn't have a moon. Sedna has no likely moon. When the planetoid Sedna was discovered last year, Astronomers noticed that it had a very slow rotation speed, only turning once every 20 days. One way to slow the rotation of a planet is through the interaction of a moon, but detailed observations of Sedna with Hubble failed to turn up any evidence of a satellite. New observations by Astronomers with the Harvard-Smithsonian Center for Astrophysics have revised Sedna's rotation speed to once every 10 hours, which is what you'd expect for an object this size. No Moon is necessary. When the distant planetoid Sedna was discovered on the outer edges of our solar system, it posed a puzzle to scientists. Sedna appeared to be spinning very slowly compared to most solar system objects, completing one rotation every 20 days. Astronomers hypothesized that this world possessed an unseen Moon whose gravity was slowing Sedna's spin. Yet Hubble Space Telescope images showed no sign of a Moon large enough to affect Sedna. New measurements by Scott Gaudi, Krzysztof (Kris) Stanek and colleagues at the Harvard-Smithsonian Center for Astrophysics (CfA) have cleared up this mystery by showing that a Moon wasn't needed after all. Sedna is rotating much more rapidly than originally believed, spinning once on its axis every 10 hours. This shorter rotation period is typical of planetoids in our solar system, requiring no external influences to explain. "We've solved the case of Sedna's missing moon. The Moon didn't vanish because it was never there to begin with," said Gaudi. Sedna is an odd world whose extreme orbit takes it more than 45 billion miles from the Sun, or more than 500 astronomical units (where one astronomical unit is the average Earth-Sun distance of 93 million miles). Sedna never approaches the Sun any closer than 80 astronomical units, and takes 10,000 years to complete one orbit. In comparison, Pluto's 248-year-long oval orbit takes it between 30 and 50 astronomical units from the Sun. "Up until now, Sedna appeared strange in every way it had been studied. Every property of Sedna that we'd been able to measure was atypical," said Gaudi. "We've shown that Sedna's rotation period, at least, is entirely normal." Sedna appears unusual in other ways besides its orbit. First and foremost, it is one of the largest known "minor planets," with an estimated size of 1,000 miles compared to Pluto's 1,400 miles. Sedna also displays an unusually red color that is still unexplained. Initial measurements indicated that Sedna's rotation period was also extreme - extremely long compared to other solar system residents. By measuring small brightness fluctuations, scientists estimated that Sedna rotated once every 20-40 days. Such slow rotation likely would require the presence of a nearby large Moon whose gravity could apply the brakes and slow Sedna's spin. 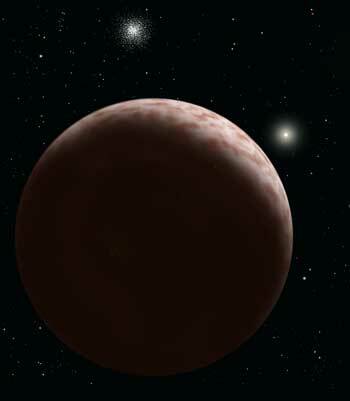 As a result of this interpretation, artist's concepts released when Sedna's discovery was announced showed a companion moon. One month later, images taken by NASA's Hubble Space Telescope demonstrated that no large Moon existed. In true detective fashion, Gaudi and his colleagues re-investigated the matter by observing Sedna using the new MegaCam instrument on the 6.5-meter-diameter MMT telescope at Mount Hopkins, Ariz. They measured Sedna's brightness looking for telltale, periodic brightening and dimming that would show how fast Sedna rotates. As noted by Matthew Holman, one of the members of the CfA team, "The variation in Sedna's brightness is quite small and could have been easily overlooked." Their data fits a computer model in which Sedna rotates once every 10 hours or so. The team's measurements definitively rule out a rotation period shorter than 5 hours or longer than 10 days. While these data solve one mystery of Sedna, other mysteries remain. Chief among them is the question of how Sedna arrived in its highly elliptical, eons-long orbit. "Theorists are working hard to try to figure out where Sedna came from," said Gaudi. Astronomers will continue to study this strange world for some time to come. "This is a completely unique object in our solar system, so anything we can learn about it will be helpful in understanding its origin," said Stanek. This research has been submitted to The Astrophysical Journal Letters for publication and is posted online at arxiv.org/abs/astro-ph/0503673.